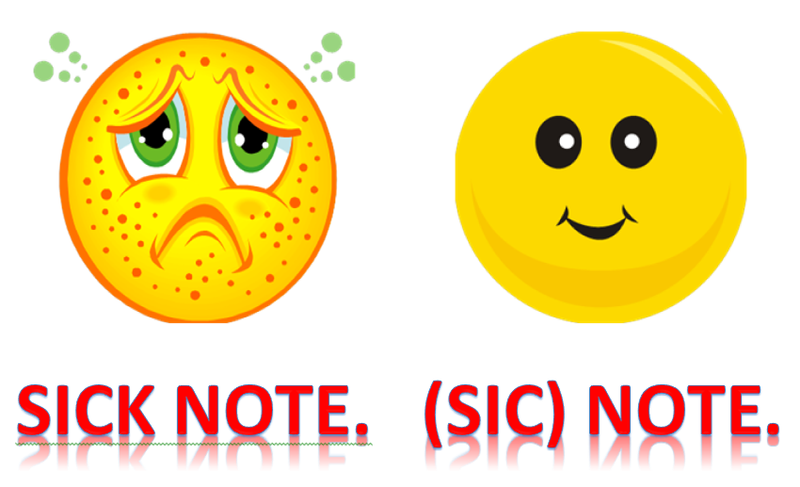 The delightful Aussie colloquialism ‘sickie’ can describe both the person who is sick, and the time taken off work to allow said sickness to flourish to its full potential. Unfathomably, many employers still require a certificate even for one or two days out of the cell. This completes the only known consultation where the one sentence covers all four components—presenting complaint, history, diagnosis and management. I usually cut-and-paste x4, and hope Medicare doesn’t audit my notes. Interestingly, one doesn’t ever have a sickie or suffer from a sickie—no; one always takes a sickie, in the same way an employee, requiring a break lasting a mere ninety-sixth as long, might take five. The broader the Aussie twang, the more likely the term is being used ironically. For a sickie can sometimes imply that its taker is, in fact, the opposite of sick. The literalist would argue they had taken a wellie, the capitalist would call it a phony, while the pragmatist reckons it’s a mental health day and the suntan is part of the phototherapy. Two population subgroups utilise sickies the least. Business owners prefer to conspicuously turn up when unwell, coughing loudly over their employees, and hoarsely phoning sympathetic radio shock jocks during lunch, to berate absenteeism. The second group comprises the children of doctors. I say this as my youngest son lies on the floor in a pool of sweat, teeth grinding with rigors. I just hope his teacher thinks to phone me if he gets any worse. My little twig, unfortunate enough to find himself growing on the medical branch of our family tree, has no hope. And faking it is not an option—I’ve seen it all. The thermometer in the coffee, the Glasgow Coma score of six (responded to pain), the swollen ankle. Actually, the treating orthopod reckoned I should have taken that last one more seriously. Finally, my sons have to realise I don’t get paid to nurse them at home, despite my argument this falls under a GP Management Plan by definition. And anyway, we need the money: I’m still paying off that ankle op. This entry was posted in Uncategorized and tagged humour, medical certificate, Medical Observer, sick note, sickie. Bookmark the permalink. Another wonderful post. Thank you for the entertaining read! Although not the child of a doctor, I certainly grew up in the underutilised sickie camp. The Aesop’s fable, “The Boy Who Cried Wolf”, was one of my mother’s favourite moralising tales, and to this day I remember it terrifying the life out of me. When I was about six years old, and tried to take my first great Aussie sickie, Mum vividly related “The Boy Who Cried Wolf” story, and soon I was begging her to take me to school. She had me convinced that I was going to die of a horrible illness one day because no one would believe me when I said I was sick. She refused to take me to school but instead made me sit quietly all day without any books/toys/TV and consider the potential consequences of my actions. It worked. I never exaggerated symptoms of illness again. Mind you, Mum often didn’t believe my genuine complaints either. For example, at the age of ten I sustained a significant radius/ulna fracture requiring internal fixation, and my mother yelled at me for being a sook, not knowing the extent of my injury. My brother fared worse than I with undiagnosed appendicitis and a significant L4/L5 fracture being put in the “stop your whinging, you’re fine kid” category. Her “I breed ‘em tough” campaign may have gone a bit far at times but she was right about one thing: what didn’t kill me did make me stronger. I have no concrete evidence that such child-rearing techniques increase resilience and stoicism in adulthood but I’d like to believe they do – that Mum was indeed doing it for my own good! Good on you, Mrs Yates! No wonder your daughter is so wonderfully robust. Except when poked in the radius or ulna. I’ve remembered your soft spot now, Genevieve, although I promise to never, ever use it against you. Not unless you do something a bit annoying or I get bored. In the spirit of balanced reporting, I should point out that my Mum is a very caring person and gave my brother and me a wonderfully supportive upbringing. We were never short of love and attention, but whinging never got us kids far. Personally, I think that many children would benefit from a dose of my mother’s medicine, just perhaps diluted a little, or served with a spoonful of sugar. Thank you to my Mum, my foil in obtaining an afternoon off. The phone call advising where the excrement needed cleaning up from our house described an image out of ‘What We Do In The Shadows’, but was surprisingly well received. And it saw me promptly removed from the office, without ever issuing any falsehoods about an attack of gastro-enteritis.